This book guides readers through the basics of rapidly emerging networks to more advanced concepts and future expectations of Telecommunications Networks. It identifies and examines the most pressing research issues in Telecommunications and it contains chapters written by leading researchers, academics and industry professionals. 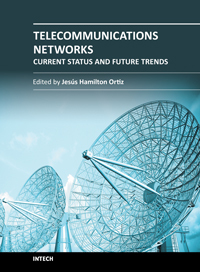 Telecommunications Networks - Current Status and Future Trends covers surveys of recent publications that investigate key areas of interest such as: IMS, eTOM, 3G/4G, optimization problems, modeling, simulation, quality of service, etc. This book, that is suitable for both PhD and master students, is organized into six sections: New Generation Networks, Quality of Services, Sensor Networks, Telecommunications, Traffic Engineering and Routing. Jesús Hamilton Ortiz earned his Bachelor\'s degree in Mathematics and Electrical Engineering from the Universidades Santiago de Cali and Universidad del Valle in Cali Colombia. He then went on to earn a D.E. in Telematics Engineering from the Universidad Politécnica de Madrid, and a Ph.D. in Computer Engineering from the Universidad de Castilla la Mancha. In 2016 he earned his Ph.D in Telecommunication Engineering from the Universidad Autonoma de Madrid.